Alloys 316 (UNS S31600) and 316L (UNS S31603) are molybdenum-bearing austenitic stainless steels, which are more resistant to general corrosion and pitting/crevice corrosion than the conventional chromium-nickel austenitic stainless steels such as Alloy 304. These alloys also offer higher creep, stress-to-rupture, and tensile strength at elevated temperatures. In addition to excellent corrosion resistance and strength properties, the Alloys 316 and 316L Cr-Ni-Mo alloys also provide excellent fabricability and formability which are typical of the austenitic stainless steels. Alloy 316/316L (UNS S31600/S31603) is a chromium-nickelmolybdenum austenitic stainless steel developed to provide improved corrosion resistance to Alloy 304/304L in moderately corrosive environments. It is often utilized in process streams containing chlorides or halides. The addition of molybdenum improves general corrosion and chloride pitting resistance. It also provides higher creep, stress-to-rupture and tensile strength at elevated temperatures. It is common practice for 316L to be dual certified as 316 and 316L. The low carbon chemistry of 316L combined with an addition of nitrogen enables 316L to meet the mechanical properties of 316. Alloy 316/316L resists atmospheric corrosion, as well as, moderately oxidizing and reducing environments. It also resists corrosion in polluted marine atmospheres. The alloy has excellent resistance to intergranular corrosion in the as-welded condition. Alloy 316/316L has excellent strength and toughness at cryogenic temperatures. Alloy 316/316L is non-magnetic in the annealed condition, but can become slightly magnetic as a result of cold working or welding. It can be easily welded and processed by standard shop fabrication practices. In most applications Alloy 316/316L has superior corrosion resistance to Alloy 304/304L. Process environments that do not corrode Alloy 304/304L will not attack this grade. One exception, however, is in highly oxidizing acids such as nitric acid where stainless steels containing molybdenum are less resistant. Alloy 316/316L performs well in sulfur containing service such as that encountered in the pulp and paper industry. The alloy can be used in high concentrations at temperatures up to 120°F (38°C). Alloy 316/316L also has good resistance to pitting in phosphoric and acetic acid. It performs well in boiling 20% phosphoric acid. The alloy can also be used in the food and pharmaceutical process industries where it is utilized to handle hot organic and fatty acids in an effort to minimize product contamination. Alloy 316/316L performs well in fresh water service even with high levels of chlorides. The alloy has excellent resistance to corrosion in marine environments under atmospheric conditions. The higher molybdenum content of Alloy 316/316L assures it will have superior pitting resistance to Alloy 304/304L in applications involving chloride solutions, particularly in an oxidizing environment. In most instances, the corrosion resistance of Alloys 316 and 316L will be roughly equal in most corrosive environments. However, in environments that are sufficiently corrosive to cause intergranular corrosion of welds and heat-affected zones Alloy 316L should be used because of its low carbon content. Chromium 16.0 min.-18.0 max. 16.0 min.-18.0 max. Nickel 10.0 min.-14.0 max. 10.0 min.-14.0 max. Molybdenum 2.00 min.-3.00 max. 2.00 min.-3.00 max. 0.2% Offset Yield Strength, ksi 44 30 min. 25 min. Ultimate Tensile Strength, ksi 85 75 min. 70 min. Elongation in 2 inches, % 56 40 min. 40 min. Hardness, Rockwell B 81 95 max. 95 max. Alloy 316/316L can be easily welded and processed by standard shop fabrication practices. Working temperatures of 1700 – 2200°F (927 – 1204°C) are recommended for most hot working processes. 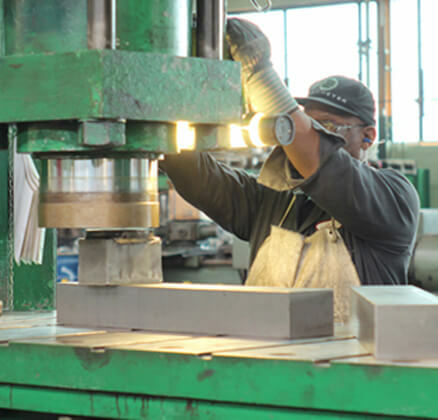 For maximum corrosion resistance, the material should be annealed at 1900°F (1038°C) minimum and water quenched or rapidly cooled by other means after hot working. Alloy 316/316L is subject to work hardening during deformation and is subject to chip breaking. The best machining results are achieved with slower speeds, heavier feeds, excellent lubrication, sharp tooling and powerful rigid equipment. weld heat treatment is not necessary.